Category: No Credit? No Problem! No credit needed for these articles! 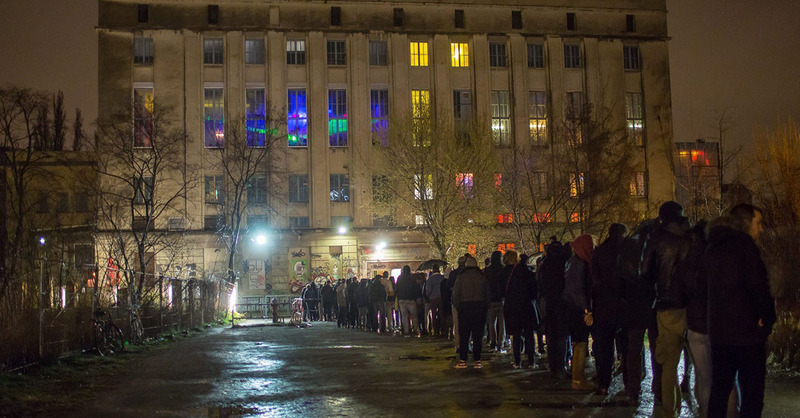 I know a lot of my readers are interested in Berlin for the music scene (Hello Berghain) and culture so this Black Friday deal might be right up your alley! 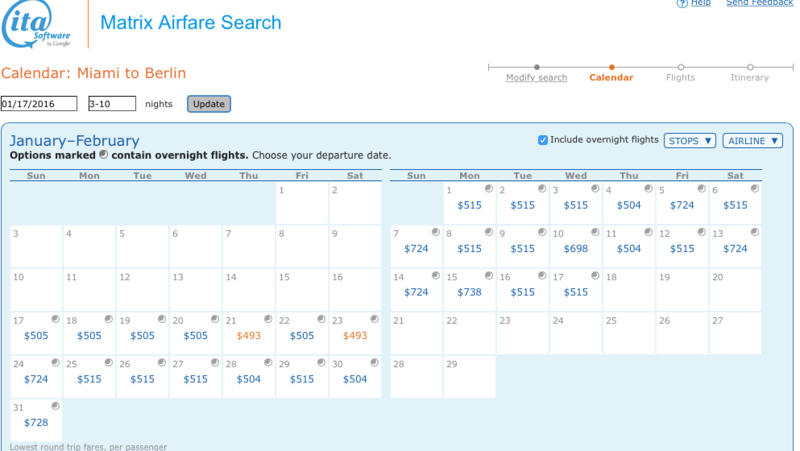 Our friends over at Flight Deal found a great fare on Air Berlin from Miami to Berlin for $503! We found similar fares for many dates in both January and February 2016. 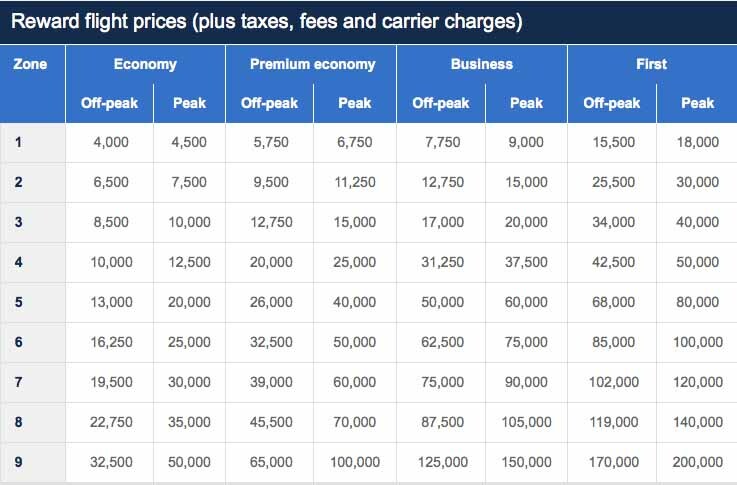 Here is a sample fare from Priceline leaving January 21, 2016. Air Berlin is a member of the Oneworld Alliance so you could credit the miles to either British Airways or American Airlines for easier use. Getting to Europe this cheap even during the off peak season is awesome! Fares this low usually go quickly so if you are interested, I would book sooner rather than later. As always, reply with any questions and follow me on Google+, Facebook, Twitter and Instagram to make sure you don’t miss any great info! And don’t forget to share this article with anyone who might be interested using the handy social share buttons right below this post! Author John ButlerPosted on November 28, 2015 November 28, 2015 Categories No Credit? No Problem!Leave a comment on Awesome Deal Alert – Miami to Berlin, $503 round trip! This time of year brings a bunch of holiday shopping promotions where you can earn tons of extra miles! 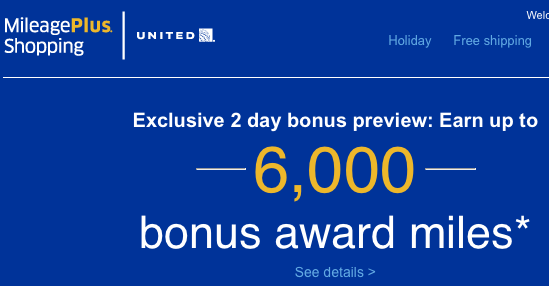 United MileagePlus Shopping just announced a promotion where you can get up to 6000 bonus miles on top of what you would normally receive. If you have never shopped online and earned miles then check out this article on Online Shopping for Mega Miles. Here are the details on this promotion. This offer is cumulative which means you can get the bonus even if you shop over different orders and different merchants. The offer is valid from November 6th – 24th. This is a great time to get some Christmas shopping done and make a bunch of extra miles doing it! If you stack this with some of their current specials such as Nordstrom’s for 12 miles per dollar, then you could get 21,000 miles for $1250 in spending which is just about enough for a free ticket anywhere in the US! Note, I don’t see a splash screen when I click on the link so here are the terms and conditions that were contained in the email I received. This offer is automatically applied to all purchases during the promo period so just shop through the portal and you are all set! Author John ButlerPosted on November 6, 2015 November 6, 2015 Categories No Credit? No Problem!, Online Shopping, United MileagePlus3 Comments on 6000 Bonus United Miles for shopping online! Starwood Preferred Guest just announced a promotion from now until August 31, 2015 where you can get a bonus 1000 Starpoints whenever you have a stay that includes a weekend night (defined as Fri, Sat or Sun except in the middle east where it is Thu, Fri, and Sat). This promotion can be a sweet deal especially if you have a low cost one night weekend stay to boost your points earnings. To maximize it if you didn’t mind moving properties a bit, you could do three different SPG properties on Friday, Saturday, and Sunday nights and get 3000 extra Starpoints plus you get to see different properties too! 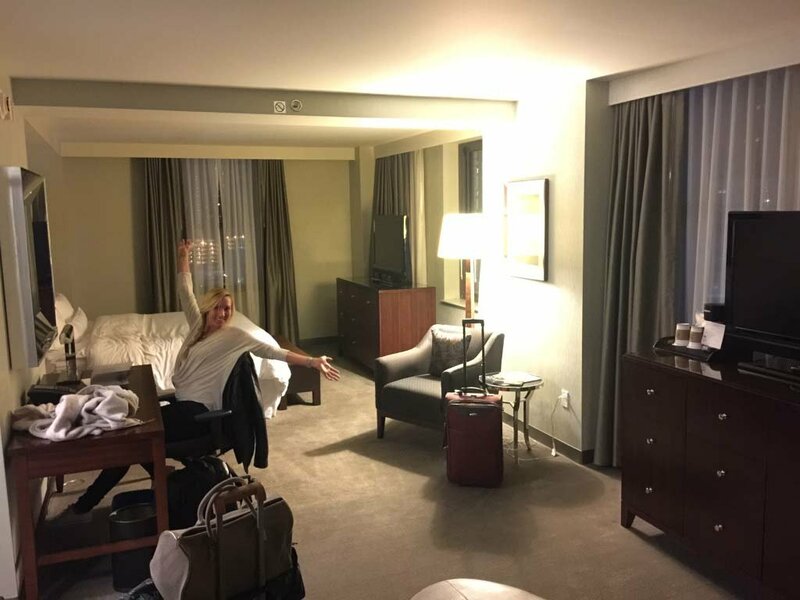 I recently used 10,000 Starpoints a night to score this room in Detroit during the Movement music festival. Paid rates were $379 a night which gave me a value of 3.79 cents per point! This promotion will get you 10% of a free room like this every time you use it which is pretty nice! Free points are always welcome. We will see what the other chains come up with this quarter to find the best value and let you know our thoughts! 1000 free points for e-Statements? Sign me up! Happy Belated Earth Day! Author John ButlerPosted on April 24, 2015 May 1, 2015 Categories Club Carlson, No Credit? No Problem!Leave a comment on 1000 free points for e-Statements? Sign me up! Happy Belated Earth Day! Staples has one offer running this week (through Saturday) and another next week (Starting this Sunday) that you can combine to earn 4000 Miles in Minutes and make $12 too! You would have to fly from New York to Rome to get this many miles but with this method you can get them in just 15 minutes without leaving your home town! If you read our article on the Secret to Savings on Southwest, you know that this is enough miles to fly you round trip from Florida to Texas! Or you could use 5000 miles to book a night at this amazing property in Tibet with the latest round of Pointbreaks! If you read our article last week on the Secret to Savings on Southwest then you already know how to use to map search to find great points redemptions values on cities that Southwest flies to. What if I told you there was a secret spot on the Southwest web site where dirt cheap fares were hidden? I look at travel deals all day long, but I still didn’t know about this discovery until recently! Uber Users! Get Free SPG Hotel Points for Every Ride! Starwood Preferred Guest is one of my favorite hotel chains due to the beautiful properties and especially the great value I am able to get on point redemptions. I regularly get 4 cents or more per point on my hotel redemptions which is incredible so I am always after as many SPG points as I can get. 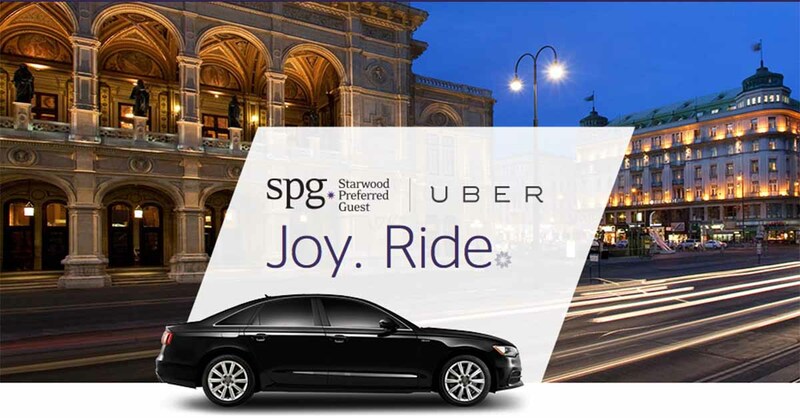 When I saw that Uber had announced a partnership with SPG I was thrilled! The base level is 1 Starpoint per dollar spent on Uber, but you can get bonus points during days where you have an SPG stay (including the check in and check out dates). The bonus amounts vary with your status level with SPG. I love all of these partnerships that the various hotels and airlines have come up with because it means extra points which are always welcome. Author John ButlerPosted on March 2, 2015 Categories No Credit? No Problem!, Starwood Preferred GuestLeave a comment on Uber Users! Get Free SPG Hotel Points for Every Ride! 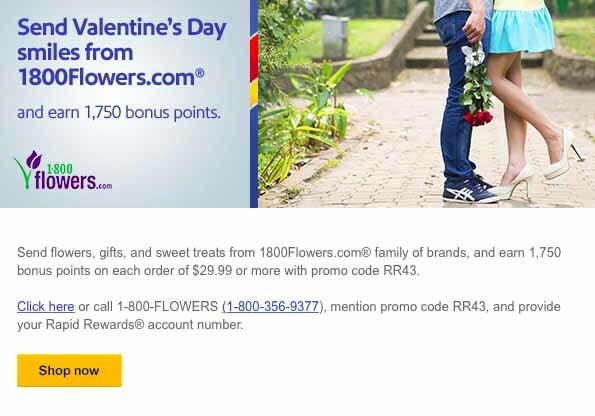 Earn 1750 Miles by Giving Flowers to your Valentine! Southwest Rapid Rewards and JetBlue TrueBlue are having a promotion until February 15 where you can get 1750 Bonus Miles for every single order you place of $29.99 or more at 1800Flowers.com! To get the bonus miles you have to enter the following promo codes when you order. Order some flowers for someone and make some miles too! What a deal! You can enter the Promo Code on the billing details page where you enter your credit card number. Since shipping can sometimes kill deals like this, if you are planning on ordering multiple orders then make sure to sign up for their Passport program which gives you free shipping for a year for $29.99. It should pay for itself after just a few orders. 1750 Southwest Miles are worth approximately $26 in Wanna Get Away fares so you can see this is an awesome value and you are almost getting the points too! Author John ButlerPosted on February 5, 2015 Categories No Credit? No Problem!, Online ShoppingLeave a comment on Earn 1750 Miles by Giving Flowers to your Valentine! 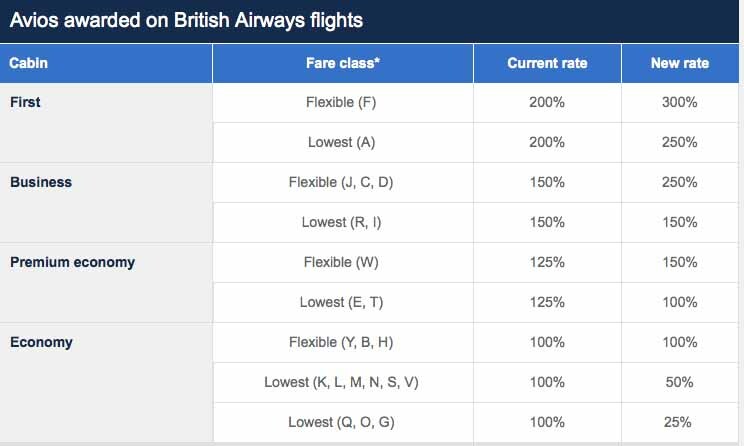 Bad changes coming to BA Avios and why I don’t care. I mainly use BA Avios to book American short haul flights. For example, Miami to Cancun for $72 and 9000 Avios, Costa Rica for $45 and 15,000 Avios, Panama for $62.50 and 20,000 Avios, and Chicago for $5 and 15,000 Avios. Since all of these flights are less than 3 hours, I usually just book coach and save my miles for the long haul flights to Europe and beyond. Well, none of these redemptions will change one bit with the announced changes! I just returned from the BPM Festival in Mexico and I will be able to buy the same cheap seat after these changes take place that I purchased before for just 9000 miles! So for me, the 50,000 sign up bonus for the BA Visa card is just as valuable as it was before this announcement. I know some people liked the 50K round trip business class fares from Boston to Dublin and the 50K round trip business class from NYC to LA, those weren’t something that I used so it isn’t something that I will miss. If those bookings interest you then make sure to make them before April 28, 2015 to take advantage of the old prices. While I hate seeing any negative changes at all, this is how the game is played and you are forever shooting at a moving target. That is why my advice to everyone is to earn miles as fast as you can, then burn them just as fast. See the world for free while you can because we never know what is around the next bend. But if you like to fly last minute like I do, don’t mind coach for short flights and are looking to travel around the Americas for a song, then in my opinion little has changed with this announcement. Author John ButlerPosted on January 29, 2015 Categories British Airways Avios, No Credit? No Problem!Leave a comment on Bad changes coming to BA Avios and why I don’t care.